This co-curricular group meets weekly during the academic year in the Indigenous Visual Culture (INVC) office on Floor 4, 113 McCaul St. It is facilitated by Carrianne Leung, the author of the novel The Wondrous Woo as well as an OCAD U LAS/SIS sessional faculty member and the manager of the Writing & Learning Centre. Carrianne brings her expertise in creative writing to the weekly sessions where participants will have the opportunity to share work and hone their craft. This co-curricular group will seek to bring voices from the margins to the centre, and to celebrate a range of narratives in all their complexities. Shameless Magazine, a nationally distributed publication focusing on young women and trans youth, will offer publication opportunities to interested participants. The group will host public reading events and publish an anthology featuring participant work. The writing circle welcomes drop-in participants and is open to all OCAD U students. For more information, please contact Carrianne Leung at cleung@faculty.ocadu.ca. This initiative is co-presented by the Writing and Learning Centre and the Office of Diversity, Equity & Sustainability Initiatives, and supported by the Indigenous Visual Culture Program, Shameless Magazine and the Creative Writing program at OCAD U. 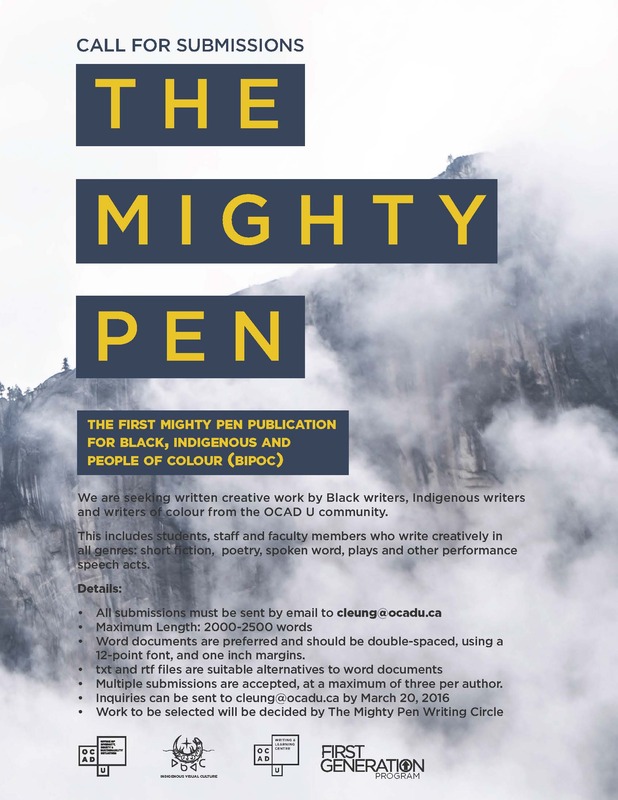 The first Mighty Pen publication for OCAD U community members who identify as Black, Indigenous and people of colour (BIPOC). We are seeking written creative work by Black writers, Indigenous writers and writers of colour from the OCAD U community. This includes students, staff and faculty members who write creatively in all genres: short fiction, poetry, spoken word, plays and other performance speech acts. Word documents are preferred and should be double-spaced, using a 12-point font, and one inch margins. Multiple submissions are accepted, at a maximum of three per author.